Keyrings out of beads, made in Kwazulu Natal be Zulu women. 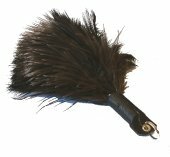 Keyrings out of ostrich feather and leather, very funky and durable. You will never loose your key again! Keyrings out of leather and Zebra or Nguni Cowhide, quite classy and different. The pens are out of porcupine quills and ostrich feathers, quite an eye-catcher for any desk or nice present. Fluffy keyrings out of ostrich feathers. The natural variety is the dark grey (female) or the black (male) one. Feathers are complemented by soft ostrich leather.